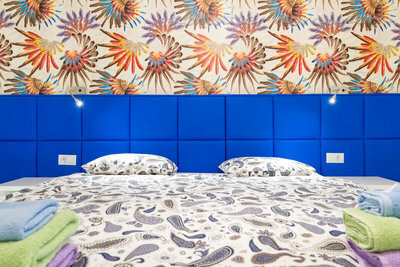 Located in the heart of the Old City of Dubrovnik, just a few steps away from restaurants, galleries and all the historical monuments. 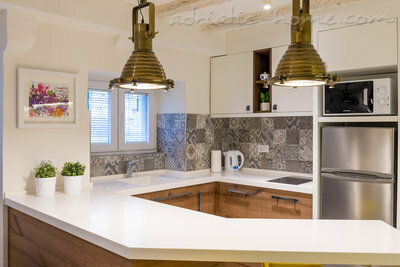 One bedroom apartment in the center of the Old Town is ideal for couples, friends and families with children who want to take advantage of all that Dubrovnik has to offer. The most popular beach Banje „East West Beach Club“ is located just 5 minutes walking distance and Buza bar jut 1 minute walking. Bus station is just 3 minutes walking distance, while the town itself has everything, including concerts, theaters, galleries, historical museums, post office, banks, night clubs, numerous restaurants and bars. Accommodation - BREAKFAST INCLUDED IN THE PRICE !! 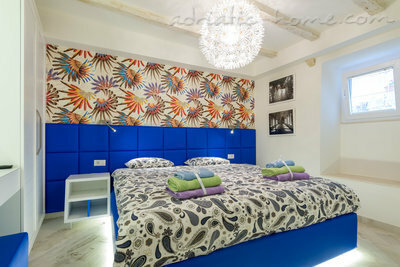 Bedrooms 2+2: The spacious bedroom overlooking the City Walls, the bedroom is equipped with queen size bed and large closet. 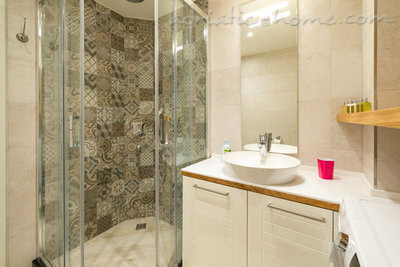 Bathrooms: Bathroom with shower, toilet, water heater and hair dryer. 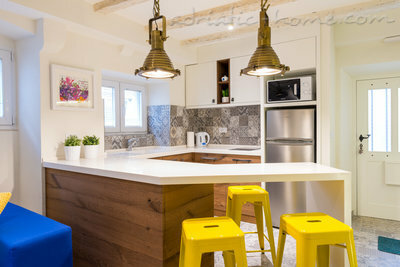 Kitchen: Kitchen is fully equipped with hob, fridge, freezer, microwave oven, toaster and all necessary utensils. 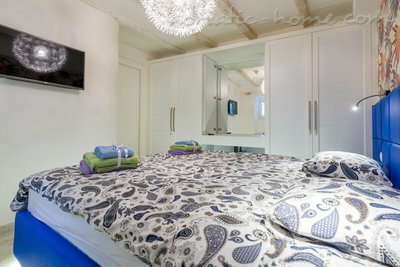 Apartment is the best choice for couples, friends or families. Capacity is two to four people. 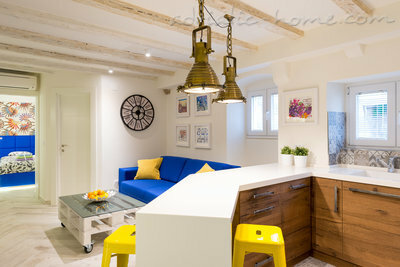 Completely renovated and carefully decorated. (Satellite TV, air conditioning, DVD player). Cleaning / towels / linen / service: Towels and linens are included in price. 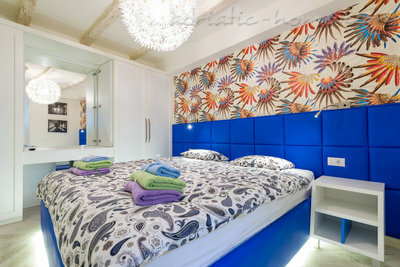 Cleaning is carried out before and after your stay. 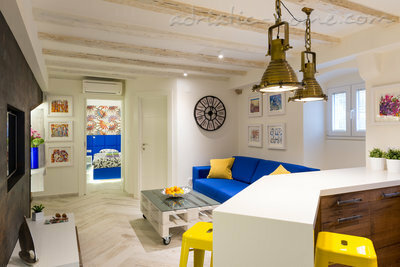 How to find us: The apartment is located in the center of Dubrovnik. Cars are not allowed in the Old town, but if you travel by car, public garage is located 10 minutes away. Dubrovnik airport is located 20 km away, and we recommend our transfer service or airport shuttle bus that goes to the bus station Pile, which is 3 minutes walking distance from the apartment Petra. 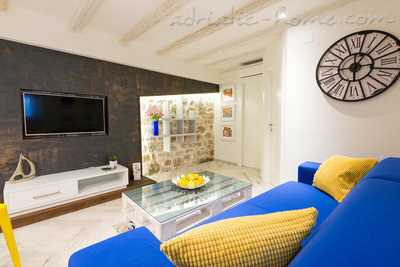 If you are staying in the apartment Petra 8 days or longer we offer a discount of 10%. Long term and winter rates are negotiable. Changeover day in any day. Check in from 14:00 PM; check out until 10:00 AM. If you need an earlier arrival or late departure we kindly ask you to inform us in advance. 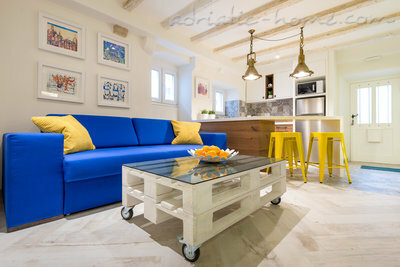 When designing and decorating the Apartment Petra we strive to create an attractive and private atmosphere that will meet the needs of our guests. Visit us and grant yourself and your family a most pleasurable and valuable vacation. We wish you an enjoyable and most memorable stay! I can't recommend this place higher! The photos don't do this apartment justice. Such a beautiful place in the heart of old town. Great location! We felt like a local for a short 5 day stay. The breakfast inclusion is amazing! Great food and service! We ended up eating a lot at cafe festival because it was one of the best restaurants we found. Also great to do washing and it dried super quickly. Aircon in each room aswell. I will recommending to all my family and friends! The best air bnb I have stayed in! Better than a hotel! Wonderful apartment in great location. Quiet street but very central in the old town. Host, Patricia was very attentive. Highly recommended! Excelent locations, near the heart of Dubrovnik and yet very quiet and peaceful. The apartment is very cosy and corresponded and was even better than we were expecting. The apartment included breakfast in a nearby restaurant. Petrica and the team were helpful. We were a family of 4. 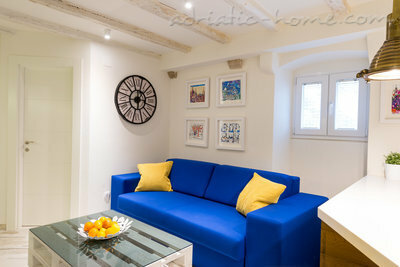 I certainly recommend this apartment for a stay in Dubrovnik. L'emplacement est idéal pour visiter la ville , rien n'est jamais loin . L'appartement est très bien équipé pour pouvoir y prendre des repas et s'y sentir bien entre deux visites . La gentillesse et le professionnalisme de Petrica et Damir nous a permis d'avoir un séjour encore plus agréable : conseils et services furent au rendez vous . Un panier de fruits frais et une bouteille de vin nous attendait à l'arrivée . Les produits de première nécessité ne manquent pas . Chaque matin un petit marché se trouve à quelques pas de l'appartement et permet de compléter les besoins . L'appartement est très calme tout en étant très proche du centre , cela nous a permis de nous reposer entre deux visites ! Quant au petit déjeuner au restaurant le Festival , il était parfait avec des serveurs très souriants . 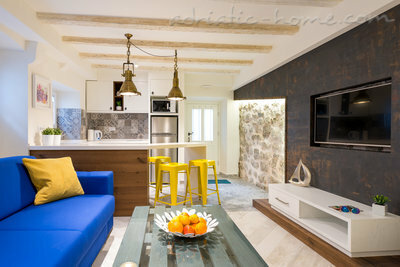 Nous reviendrons à Dubrovnik et nous choisirons de nouveau cet appartement !! Merci à Petrica et à Damir de nous avoir préparé ce beau séjour !! The perfect apartment in the perfect city! My partner and I stayed at the Petra apartment at the beginning of July, we were given instructions by Petrica on how to get to the cafe to then be given the key and shown the apartment. It was very easy and communication was fantastic. The location of the apartment was amazing, seconds from beautiful cafes and restaurants and the main square, where we were given free breakfast every morning. The apartment was seconds from the Buza bar where it is lovely to have an afternoon drink or jump off the rocks, and only a few minutes from Banje beach. Walking around the old town is so picturesque and like a dream... The beautiful walls walk is a must to take in the views. The apartment itself was lovely to come home to after spending hours in the sun, with great aircon, it was modern and clean, with washing machine, great shower, big comfortable bed, two TV's and efficient wifi. We couldn't have asked for anything else! I can't recommend the apartment enough, and I will definitely be back. Thank you Petrica and Damir! We loved our stay in Petricia's gorgeous flat. It was an incredible location in Dubronik Old Town just minutes walk from all the bars and restaurants. The flat has recently been furnished so everything is brand new. It was very clean and spacious, perfect for two people. It was lovely and quiet in the evening. Dubrovnik itself was absolutely stunning - we were really blown away. Petricia made everything about our stay so easy and was always able to answer our questions quickly. Daimir at Cafe Festival was also very kind and helpful. It was great to be able to leave our bags there and get a free breakfast. All in all we had a wonderful stay and would love to come back and stay in the apartment again soon! Thank you! Petrica's apartment was a dream come true for me. Beautiful, located right by Buža 1 and near Buža 2, two beaches that I've been dreaming of since I first saw them in 1989. Petrica was a great host, responded to every e-mail within minutes and I could not have had a better vacation because of her. I can't recommend her and the flat enough! When visiting Dubrovnik it is a must to stay within the walls of the city. And Petra's apartment is extremely well located, a short distance from the main square, steps away from the wall and the bars overlooking the ocean. 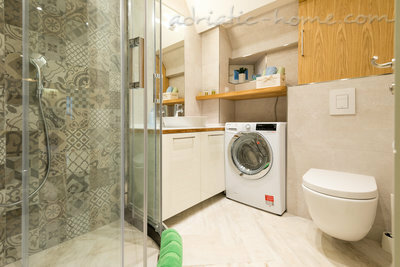 Great apartment, very well equipped will all that you might need for a short stay. The pictures don't do justice to this beautiful place. On top of all, great breakfast is included at Cafe Festival, a short distance away in the main street. Can't emphasize enough how welcoming and friendly everyone was. 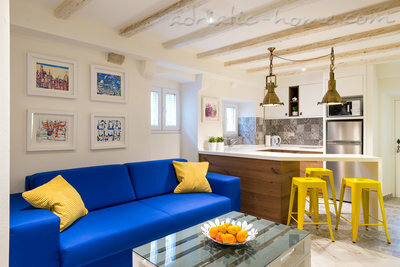 You have to visit Dubrovnik, and if you do Petra's is a great place to stay.